PLAYGROUND APPROVED - Your little one will be the talk of the playground with the Wildkin 12 Inch Backpack! Eye-catching patterns and a functional design come together to make this backpack a fun addition to your child's school and travel essentials. Two padded, adjustable shoulder straps provide a comfortable wear, while the durable top handle is perfect for hanging in a cubby before heading out to recess. Your little one will be the talk of the playground with the Wildkin 12 Inch Backpack! Measuring 12 x 10 x 4.5 inches, the 12 Inch Backpack has a just-right size that’s perfect for packing all the essentials, plus some after school snacks! With backpacks, it’s all about the features, and Wildkin’s 12 Inch Backpack is full of features that put the “fun” in “functionality”. Two padded, adjustable shoulder straps provide a comfortable wear, while the durable top handle is perfect for hanging in a cubby before heading out to recess. 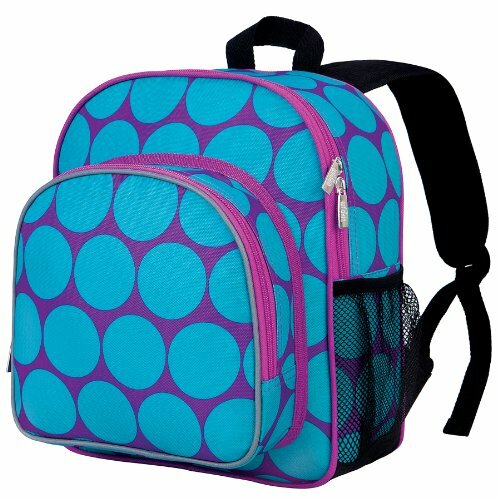 Its two zippered compartments and side mesh water bottle pocket make staying organized a breeze! Leave the lunchbox at home – the 12 Inch Backpack’s front zippered compartment is insulated, easy-to-clean, and food-safe – perfect for storing lunches and snacks. Additionally, the exterior of the front zippered pocket features reflective tape to help keep your little one safe and seen when it’s dark outside. As always, all of Wildkin’s 12 Inch Backpacks feature vibrant, playful patterns, so your child will love this fun new addition to their school and travel gear. Can’t get enough of Wildkin’s awesome patterns? Each 12 Inch Backpack was designed to coordinate with other Wildkin gear, so go ahead and make a theme out of it! From nap mats to lunch bags, your child will love having their favorite designs with them on-the-go. Spot clean only. When necessary, use mild soap and damp washcloth to clean lunch bag interior. Do not store or close lunch bag unless dry. 90-day manufacturer's warranty against defects – normal wear-and-tear and misuse excluded. Rigorously tested to ensure that all parts are lead-safe, bpa-free, phthalate-free, and conform to all rules and regulations set forth by the Consumer Products Safety Commission.